These lines from Rupert Brooke’s most famous poem present a very different perception of the First World War from the one that is commonly held today. To 21st century eyes it is impossible to blink at the industrial scale of the carnage of World War One; the incompetence of the generals and the appalling conditions in which those at the Front were forced to suffer. All this is very far removed from the sentimental- even glutinous – patriotism of Brooke’s poem which lauds the nobility of death and the glory of sacrifice. ‘Unexamined Lives’ has not flinched from confronting the grim reality of a war anomalously referred to as ‘Great’, and in so doing we have used contemporary records, diaries and newspapers from that era – yet the Brooke sentiments also have their place in the years between 1914-1918. At the outset, with Kitchener’s words of ‘Your Country Needs You’ ringing in their ears, young men raced to enlist, lied about their age and marched to war basking in the admiration of their loved ones. This was a not- to -be- missed chance to serve their country and the war would be over in a short time anyway. Better to live the rest of their lives as heroes, rather than skulking in corners as white- feathered cowards who had shamed their families by refusing the national call. 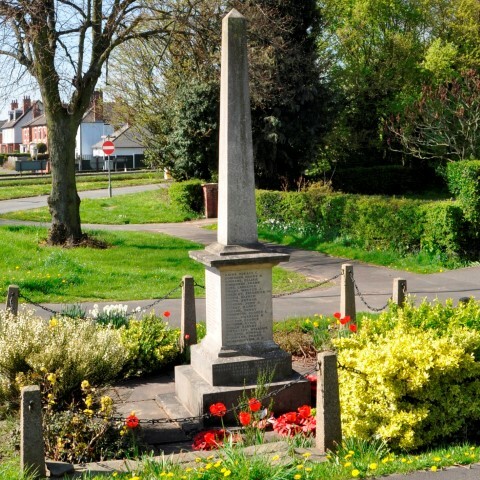 As our researchers, Keith Oseman and Peter Ball began to assemble the individual histories of the men (and one woman) whose names were engraved upon the Ockbrook and Borrowash War Memorial, a particular family surfaced persistently; the Hasses from the Ockbrook Moravian settlement. The Reverend Lewis St Aubin Hasse (originally from Gracehill, County Antrim in Ireland) had married Sarah Louise Ridgely from Islington. Their oldest child, Margaret Helen, trained as a VAD nurse in Ockbrook and may have nursed the poet Wilfred Owen at Netley hospital. She was to become a fatality of the ‘flu epidemic that devastated Europe at the end of the war and is the lone woman commemorated on the village War Memorial. The second child, Gerard St Aubin does not appear to have joined up for military service and his later years were spent as a Civil servant in London, but the two youngest boys, Francis Reginald (known as Frank or Reggie) and Edwin Ridgley (known as Bobbie) went to farm land in Canada and subsequently joined the 49th Battalion (Loyal Edmonton Regiment) Canadian Infantry and volunteered for war service in Europe. Frank survived the war and Canada was home to him for the rest of his life. Edwin’s name alongside that of his sister, Margaret, is engraved upon the Ockbrook and Borrowash War Memorial. Frank may have survived World War One but he certainly didn’t forget it. 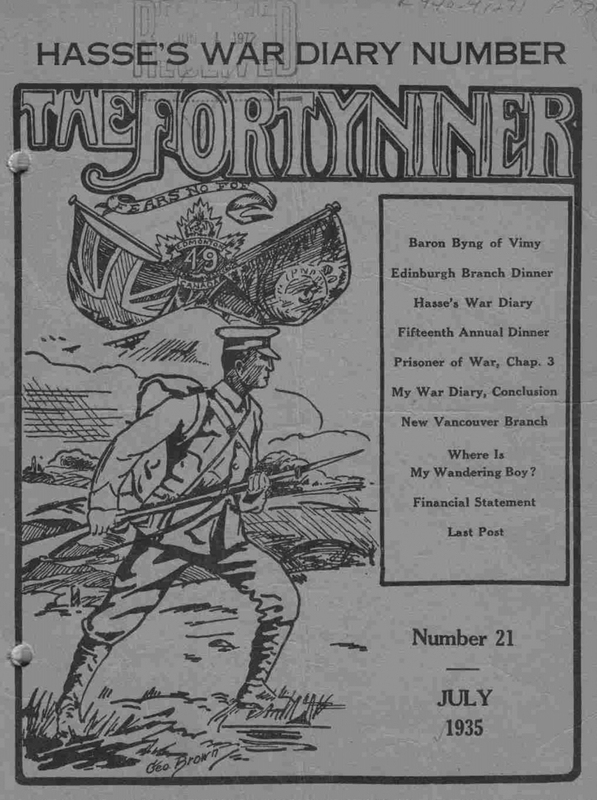 In fact, when Peter Ball discovered the existence of a collection of war magazines named ‘The FortyNiner’ in honour of the regiment, it became apparent that Frank’s First World War experiences had never left his mind. Many years after World War One had ended he was still mailing regular extracts from his wartime journal to the magazine for publication; they make for extremely gruesome reading and the passage of time has not lessened their impact. It is almost as if Frank was trying to ensure that ‘lest we forget’ was not an option for his readers because he certainly could not and neither did he want to. The diaries serve as a ‘Memento Mori’ for his comrades (including his brother) who lost their lives on the battlefield in the cruellest war in history. The contents of Frank’s FortyNiner wartime diaries formed the centrepiece of my writing about World War One in the 2014 centenary year, but by then, Keith Oseman’s interest in the Hasse family had been truly whetted. He began to research other sources; primarily Canadian websites including the Government website and that of the 49th Battalion Loyal Edmonton Regiment in search of additional material. We expected that any new discoveries would be about Frank who had survived the war, but the person who emerged was his youngest brother Edwin….and also we discovered a soldier’s perspective on the First World War that seems at times, more akin to the sentiments of Rupert Brook than Frank’s writings. Edwin’s war service was to be just over a year in length. After military training at Shorncliffe Camp in Kent, the battalion embarked for France on 9th October 1915. Edwin acted as a Scout which was potentially an extremely dangerous reconnaissance role as it involved lone missions designed to estimate the relative strength and disposition of the German antagonists. In June 1916 at The Battle of Mount Sorrel near Ypres (mentioned in the letters and diaries of both brothers) the battalion came under relentless enemy onslaught and suffered heavy casualties. The men were then involved in the Battle of the Somme after the opening day of July 1st and later moved to an area called ‘Zillebeke Bund’ situated alongside a lake near the village of Zillebeke and in close proximity to Ypres. Here Edwin’s war service was abruptly terminated. On the night of 12th/13th July, he stole out alone to scout the nearby enemy trenches, was spotted and consequently shot. After his body had been recovered, he was buried in the Railway Dugout Cemetery, maintained to this day by the Commonwealth War Graves Commission. During his brief time soldiering, Edwin was acutely aware that his family remained miles away back home, worrying about his safety. He therefore became an assiduous correspondent, no doubt hoping to reassure and even amuse his anxious parents with tales of his duties and daily life. They must have appreciated this because they certainly kept the letters which passed to Frank after their own deaths. 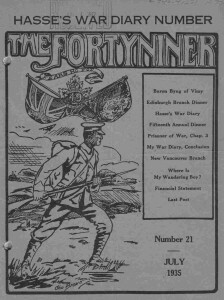 He decided that the thoughts of a First World War soldier deserved a wider audience and sent a selection to The Fortyniner. Edwin’s earliest regimental experiences appear in the July 1950 edition of this magazine under the heading ‘Do You Remember?’ and the letters have been posted to his parents from the Shorncliffe Training Camp in Kent. Months later his own brief spell in the firing line would be proof of the inevitable naivety of this early comment. With that he announces ‘I must stop now for I am off down town to Folkestone which is quite close,’ leaving the folks back home to imagine perhaps, a jolly night on the tiles with chums from camp. Over a century later, we hope that Edwin enjoyed his evening and playing at being a soldier (which is clearly what the new recruits were all doing.) Their joie de vivre would soon be tempered by the reality of life in the trenches but for now Mr and Mrs Hasse could relax, secure in the knowledge that at this early stage, Edwin was more than bearing up and did not seem to have been placed in harm’s way. The soldiers were ‘plastered’ with mud but cheered King George and the Prince of Wales lustily and the review did not take long. It was a lucky escape – at that time. During the course of his research into the Hasse family, Keith Oseman came across another set of letters written to Edwin’s parents. These were not from Edwin and are very different in tone to his breezy and uplifting accounts of the life and times of an army recruit. They are condolence letters, written by Edwin’s fellow soldiers on the occasion of his death and are intended to give what comfort they can to the grieving parents left behind in Derbyshire. On 19th July 2016, Sergeant Leslie Parkinson writes about Edwin’s last scouting mission, stressing that the young soldier ‘considered it advisable to proceed alone so as to minimise the risk of being detected by the enemy.’ Edwin was reported missing the following evening and a search recovered his body. He had died of a wound to the head but Sergeant Parkinson is keen to assure the Hasses that he had ‘without doubt met his death instantaneously and without pain.’ Of course there was no guarantee that Edwin had died painlessly and his parents would be well aware of that but would deeply appreciate the kindness of the sergeant. The chaplain empathises with all the parents who have lost young men ‘on the thresholds of their young manhood’ and considers this to be ‘perhaps the greatest loss life can have,’ but asks those who mourn their children to remember that ‘they have given themselves to save the Empire and not only so but to save the very foundation of Christian civilization and the charter of small free nations.’ Edwin’s parents, in the freshness of their grief, would hardly have been giving thanks for the fact that although their son had died, the Empire was still intact, but in later years these words and others of a similar nature would have enabled them to remember Edwin with pride. We wonder if either parent made the journey from Derbyshire and took comfort in talking about their son with somebody who had shared his experiences and to whom he was more than a name of a list of casualties? Your son was a fine, brave soldier, loved by everybody and he would undoubtedly have risen in the service. Edwin has gone, but he has not been forgotten. It is a fine epitaph. For Edwin, like Rupert Brooke, we feel it was enough.